Probably one of the most poignant recordings of the entire audio collection, as Richard recalls his memories working at David Browns from his hospital bed in Sheffield. Roy Spencley who lived at High Lea Farm in Penistone all his life gives an account of the Canadian and American troops in the area during the war, as well a plane crash he witnessed in the nearby farm fields. 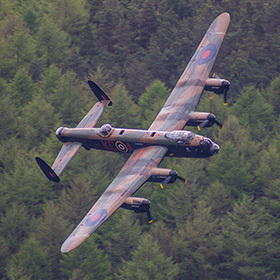 Pam Jackson gives a truly insightful recollection of her father; Sgt Wilfred Ibbotson, who was a rear gunner in 617 Squadron which later became the The Dam Busters Squadron and took part in that iconic raid. Naomi Harris who’s parents moved to Penistone in 1935 with her twin sister when they were 3 years old recalls the onset and impact of war in the local area. Anthony Arthur House and his wife Vera give a delightful account of their relationship and working life during the war effort. Jean who was only 7 years old at the start of the war whilst living with her parents in Lower Hurst Burleycarr, she recalls what life was like for young girl in the area. Ramblers vice president John Bunting who has since recording this has sadly passed away at the age of 95. Local farmer Willis Watts recals farming during the war years. I would like to make contact with Cecil Hallas on a personal matter that occured in late 1943. Please could you facilitate?